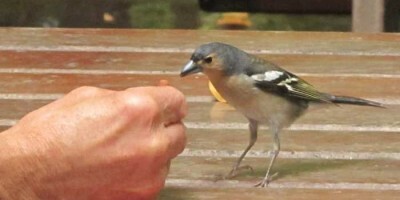 I’ve mentioned the tame Canary chaffinches at Los Tilos forest three years ago, but they’ve got much tamer since. They were coming right up to us (as long as we didn’t move suddenly) and they’ll even eat from the hand of one of the park rangers. I also saw two other birds. The common blackbird came for bread too. But the robin was much more cautious.